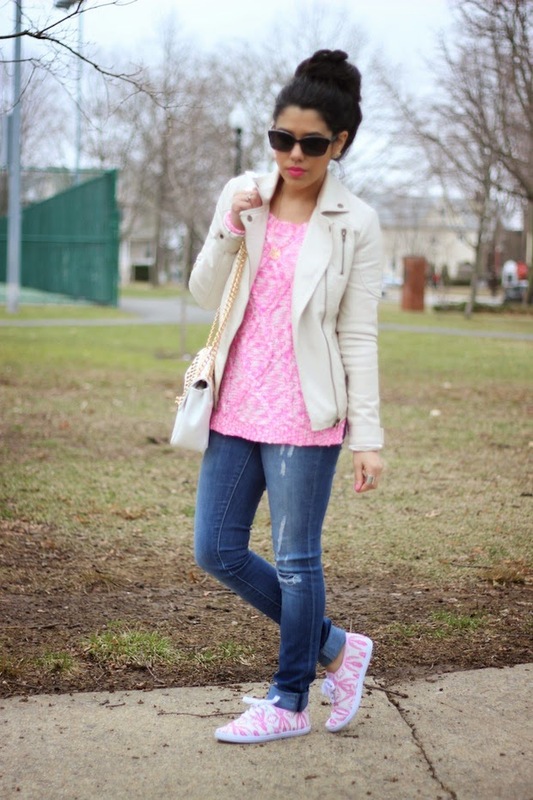 I ditched the heels this weekend for a cute and comfy pair of canvas sneakers! Wearing heels has become such a constant thing for me that sometimes I forget to focus on flats. It’s funny because I am so used to being in heels that I feel sort of awkward in shoes like this. When taking these photos, I totally did the whole “invisible heel” thing because that felt more natural to me, ha! But I have to admit that I was soooo comfortable in these and will definitely be wearing them more often. I really want to incorporate more flats into my outfits this spring/summer because realistically, a girl needs her flats! Over the weekend, I did a little bit of shopping and found these canvas kicks for only $10. They’re just so cute for wearing during the day and for a price like that, I bought two different styles. I am going to be bringing both pairs with me on my LA trip this week. As I mentioned in last week’s post, I used to be a sneaker girl. I had everything from Jordans to dunks! But now, this is my kind of sneaker 😉 The print makes them so much more fun and fashionable. On another note, my blog has reached a milestone with over 1million views! Thank you all so much for the constant support and for taking the time to view my posts. I have so much love for you. I LOVE the sneakers! They are too cute, & that's such a pretty color pink! Great look! Very cute sneaker , what a bargain and yes a girl need her flats. I love how you brought together the shirt, sneaker and a pink lip. Congrats on over 1million views 🙂 I love this casual look, the pink is super cute too! Those sneakers are super cute girl,the outfit is fun,cute and most of all it seems comfy ,heels are every girls want but flats are the NEED…lol, anyways congratulations sweet heart for the million hit , you absolutely deserve the glory …may you be more and more successfull with time ..
Those sneakers are super cute! Love the outfit, nice look!!!! Where can u get it at this price?? ?